It wouldn’t be the summer movie season without franchise entries galore, and although I proudly shirk most, two series I have always enjoyed are Star Trek and Jason Bourne. The latest episodes opened on back to back weekends and both are entertaining, serviceable entries providing escapism that hit all their required marks. But it was interesting to see how one was almost undone by its director’s ambition with action sequences, while the other was so taut and perfectly executed in its action as to take the film to another level. If Justin Lin’s smash-and-grab acrobatic incoherence is the perfect example of what not to do with action sequences, then Paul Greengrass’ intense hand-held location shooting is the masterclass of modern action direction. Being with the same cast for the third time around gives Star Trek Beyond a nice lived-in feel. We know the characters so well, as these actors have come into their own doing great jobs with Simon Pegg’s scripted witty and goofy banter that harkens back to classic Treks, especially Karl Urban as Bones. The plot is pretty basic. And since it seems like The Enterprise needs to get destroyed every time now, they wisely dispense with this in the beginning when the crew crash lands on an uncharted planet after having fallen into a giant space booby-trap. On hand as the villain, is a growling Idris Elba who seems to be the go-to guy for villains with crazy accents these days. The flick is fun and quick paced, and the special effects (especially the giant space station/city Yorktown) are colorful, bright and dazzling. I was happy to see J.J. Abrams move on from the franchise, but Justin Lin was not the right choice to replace him. Lin made quite a name for himself orchestrating some of the most gleefully over-the-top car/truck/tank/plane/whatever smash-em-ups in the otherwise brain-dead Fast & Furious franchise. Sadly, his flair for the outlandish stunt doesn’t translate as well into space. His tumbling, spinning camera moves, especially in unneccessary and washed-out 3D, don’t pick up the computer graphics and model sets as well as it did more earth-bound vehicles. It becomes increasingly hard to tell what the heck is going on during the action, and when things move to hand-to-hand combat and chasing, it becomes even more incoherent. Lin does save some face in the end with a glorious duel within a giant air intake valve on a space station, but it doesn’t make up for the headaches he delivers earlier. 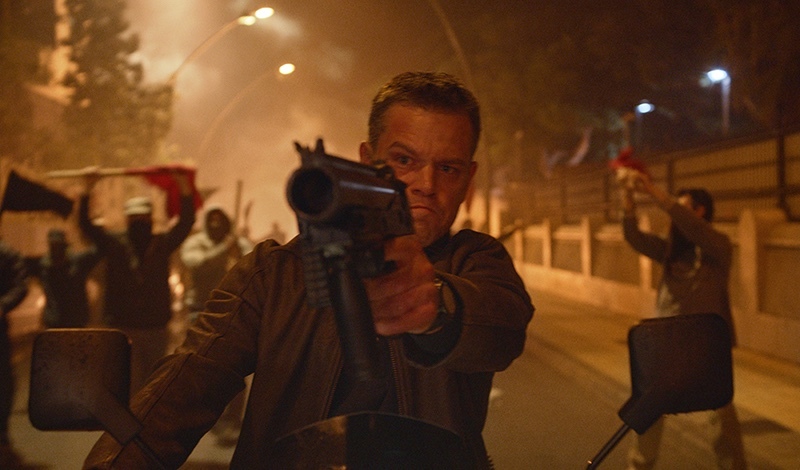 Meanwhile, in the real-world, Matt Damon arrives back on the scene in the latest teaming with director Paul Greengrass, the simply titled Jason Bourne. New on hand are Tommy Lee Jones doing a bang-up impersonation of Tommy Lee Jones, and Oscar-winning It Girl Alicia Vikander doing a wonderful Emily Blunt impersonation. The plot involves dull-as-a-dishrag Julia Stiles pulling a Snowden and threatening to reveal all about the CIA’s black ops to create the perfect killing machines. Of course she can’t help but pull Bourne into the mix (who’s been hiding out doing underground boxing matches…you know, like you did that off-year between college and grad school). Tommy Lee Jones, as the grizzled CIA Director wants to take them both out, but career climber Alicia Vikander convinces him to give her a shot at bringing in Bourne from the cold. Queue a fantastic motorcycle chase through the rioting streets of Athens at night. Bookend that with a SWAT team truck car chase through Las Vegas. I don’t know how Paul Greengrass does it (like how many hundreds of cameras must he use to pull off one ten-minute chase sequence?) but even with all its shaky-camera, quick-cut editing, never does the viewer lose sight of what exactly is going on. You always know where the principle players are during the chaos, and his “on the scene” location shooting is so crisp and well-lit that you feel like you’re right there on the vacation from hell. I don’t know if I’ve ever seen such chases and stunts done with such realism…the polar opposite of Lin’s vehicular theatrics in the Fast & the Furious and incoherent space nonsense in Star Trek. What has made the Jason Bourne franchise so sticky is that sense of realism Greengrass has brought to Robert Ludlum’s creation. The plot points are timely, and it taps into the same zeitgeist as Homeland. There are no snarky one-liners. No humor. It’s thematically dark. Yet, when that motorcycle careens down ancient Greek alleyway steps or that SWAT car takes out two rows of parked cars on the garish Vegas strip…there’s something escapist about it that puts a smile on your face. In the end, what I think I’m saying is that I’ll take my buttered popcorn in the gritty and darkened city streets of Bourne over the brightly lit fantasy worlds and outer space of Trek any day. This entry was posted in Book to Film Adaptations, Movie Reviews, Movies, Pop Culture and tagged Action, Alicia Vikander, Athens, Chris Pine, Franchise Films, Idris Elba, Jason Bourne, Justin Lin, Karl Urban, Las Vegas, Matt Damon, Outer Space, Paul Greengrass, Robert Ludlum, Sci-fi, Simon Pegg, Star Trek, Star Trek Beyond, Tommy Lee Jones. I’m hearing mixed reviews for the new Bourne movie. But I’m a fan as well and won’t miss it for anything. I agree that the Bourne series has a good overall tone and balances the twain of escapist fare and good cinema. I think it’s better than the reviews are saying. The action sequences were stupendous and Tommy Lee Jones and Alicia Vikander were great foils for each other and for Bourne. Yeah it really is a shame about Anton. Wonder how they will end up handling the character and/or recasting in future films. That will be interesting to see. Hope they’re classy as they were with Ambassador Spock. Good that you can keep up your enthusiasm for these two franchises. “Jason Bourne” I’ve stopped watching after the first two in the series, and so’s the new Star Trek team. Comparing these two, if I have to choose how to spend two hours of my time, I’d pick “Star Trek”. Maybe this is showing my age, and I don’t care a bit, I think the original TV Star Trek series is done by one of the most brilliant of minds. All other subsequent offerings pale in insights and innovations. (I mean, considering the much lesser level of scientific achievements and technological realities in the 1960’s when the first Star Trek TV series came out.) The original Star Trek series was prophetic indeed.